Dominique M Roberge, LONZA Ltd, Switzerland. 14.30 Continuous Processing – A New Paradigm in the Manufacturing of Active Pharmaceutical Ingredients? This international symposium follows on from the RSC Symposium on Continuous Flow Technology held at ChemspecEurope 2011 in Geneva. The production of speciality chemicals is still heavily reliant on batch processes, particularly in thepharmaceutical sector, and this symposium will highlight recent developments focussed on the growth of continuous processes in the fine chemicals and pharma industries. 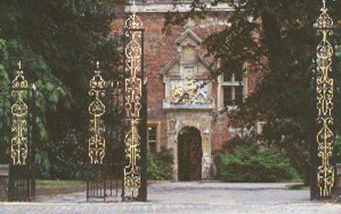 The symposium will be held at King’s Manor, part of the University of York. King’s Manor is a 16th Century building. Originally the Abbot’s House of St Mary’s Abbey, the King’s Manor served the Tudors and Stuarts as a seat of government, becoming residences in the 18th century and a school in the 19th century. It now has excellent modern facilities. Presentations will be in the Ratz Lecture Theatre, meals will be in the Huntingdon Rooms or Refectory and the exhibition will be in the Huntingdon Rooms. Details on how to get to King’s Manor can be found at http://www.york.ac.uk/np/maps/kmdirect.htm and will be given on registration. 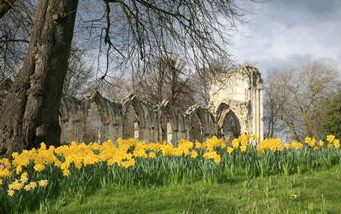 In spring the setting is particularly picturesque, especially the ruins of the Abbey from the adjacent Botanic Garden (pictured left). There are many places to stay in York close to King’s Manor. Not all accommodation has car parking space so this will be a consideration if you are driving to York. The registration fee includes attendance at the symposium, the symposium information pack and a softback of the Symposium Proceedings, refreshments and meals as listed below. The registration fee includes a Welcome Reception on 19 March, and lunches and refreshments on 20 and 21 March. The Cocktail Reception and Symposium Dinner on 20 March is not included in the basic registration fee as there are a limited number of places available.. Attendance at the Cocktail Reception and Symposium Dinner is £50 and can be booked as part of the registration fee (see below). 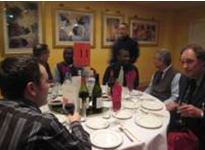 It is expected that delegates will make their own arrangements for dinner on the registration evening, 19 March. The proceedings of the symposium will be published in soft back and as a fully searchable USB stick. Delegates will receive these at the symposium.